The Post Office Cafe is one of the hottest acts in Provincetown, both in its upstairs cabaret and downstairs restaurant. The second-floor cabaret room is where you’ll find what The Boston Globe has deemed the “Best Acts in Provincetown,” with show-stopping acts such as Electra!, Atomic Bombshells and Thirsty Burlington to such legends as Suzanne Westenhoefer and Jimmy James. On the ground level, the three-star, Zagat-rated Cafe pulsates with energy from morning ’til late night. 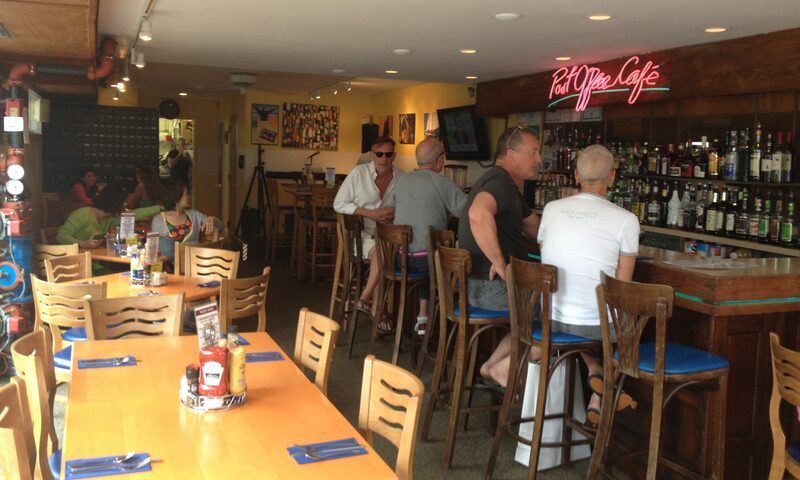 Now under new ownership, this bistro has a new vibrant look and feel including high-definition television screens for weekend sports enthusiasts to late night comedy clips and music videos. Breakfast is always packed at the Post Office, and no wonder, considering its daunting selection of fresh-fruit pancakes, first-class omelets, numerous versions of eggs benedict and hangover remedies! The new streamlined afternoon/evening menu continues to boast our signature 8-ounce char-grilled black angus sirloin burgers, bulk-rate sandwiches and wraps, bountiful seafood baskets, “dayboat fresh” catches of the day, crispy salad selections and assorted homemade pastas and lasagnas. In addition, we STILL offer the lowest priced lobster special in all of Provincetown! The Cafe bar is always open and we now offer a late night dining menu along with live entertainment. As an added feature this season, the Cafe now offers outdoor patio dining perfect for people watching on busy Commercial Street! Conveniently located, The Post Office Café and Cabaret is located directly in the center of town. Priority show seating within the Cabaret to all dinner patrons! Are you guys having a RuPaul viewing party Friday?